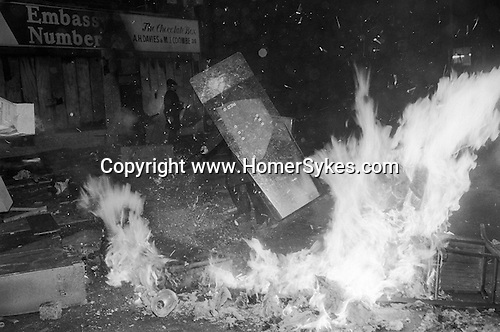 A petrol bomb explodes as police charge rioters. Toxteth was an inner-city neighbourhood of Liverpool, also known as Liverpool 8. The Toxteth riots were the result of a long standing tensions between the police and the black community. The Merseyside police being frequently accused of discriminatory and racist attitudes including the misuse of the hated 'sus' laws, which allowed police to stop and search anyone deemed suspicious. Most of these photographs of the 1981 Texteth riots show the police Operational Support Division, 'OSD'. They are identifiable by the black waterproof jackets. The divisional officers wore conventional tunics or overcoats with helmet. The OSD, where a specialist unit then numbering approx 120. Gt Manchester had a similar unit called Tactical Aid Group 'TAG'. Both units trained together with the then Royal Ulster Constabulary 'RUC' and the British army on Burtonwood airbase near Warrington. Information supplied by former member of the OSD, Brian J Monaghan.